David Lynch’s The Elephant Man works about 90% of the time. There is a tier within that 90%, where it works so well, so transcendently, so beautifully, so poignantly, so tragically, that in those moments, you feel as if you are in the presence of a true masterwork by the celebrated director, in what must be one of the most “normal” pieces in his filmography. There is a slight choppiness to the editing early on, an odd tinge to some of its emotion, that didn’t quite work for me, and keeps it from being as great as those moments, but the fact that this is a film with such a resonant message, a story told so well, that these personal problems are relegated to the smallest possible area they can occupy. John Hurt himself once said something to the effect of, “If you can get through The Elephant Man without being moved, I don’t think you’d be someone I’d want to know.” Maybe that quote is all that needs to be said about this film when it is working to its many strengths. Hurt, unrecognizable behind mounds of excellent prosthetic make-up, plays John Merrick, a 21 year old man in Victorian London who, since childhood, has been struck by an unexplainable physical deformity, which has contorted and swollen his body into a grotesque and disturbing structure, oversized and bumpy to the point where he has been dubbed “The Elephant Man”. Relegated to being part of the cheap amusement of a traveling freak show run by one Mr. Bytes (Freddie Jones), John’s appearance is exploited for money and ridiculed by passers-by day in, day out. However, upon catching the attention of a local surgeon named Frederick Treves (Anthony Hopkins), Merrick is able to leave Bytes for London Hospital, where Treves assesses his condition, and looks after him along with hospital staff – or, at least, the ones who can look at him without immediately being revolted. It is during this time where it is discovered that, in contrast to Bytes’ claims and the status of his early appearances where he would largely remain speechless and motionless, Merrick is not an invalid; quite the opposite, he is an intelligent, well-spoken, and sensitive individual, shunned and ignored by society because of his condition. The Elephant Man, of course, is based on the real life story of Joseph Merrick, and accounts of the actual Frederick Treves. And in filming this story, from Hurt to Hopkins to John Gielgud as the governor of London Hospital, you couldn’t have asked for a better cast, with such legends of British acting assembled. The acting is uniformly excellent. Anne Bancroft has a brief but vital role as Madge Kendal, a popular stage actress. The British stage veteran Wendy Hiller plays Mrs. Mothershead, a senior nurse, with convincing stoicism. Michael Elphick provides some later plot conflict in Jim, the hospital’s night watchman who sees Merrick as an opportunity to make a quick buck, charging patrons of a local pub to stop by the hospital’s isolation room and gawk at the patient, who has become something of a social phenomenon. The acting is accented by the film’s impressive technical credits, which includes Freddie Francis’ great black-and-white cinematography, adding a feeling of age and history to the proceedings. John Morris’ score is something to be noted, with a haunting main theme that takes a carnival-like sound and adds layers of emotion, creating a stellar final result. The disfigurement make-up, which took hours to apply to Hurt each day, is superbly detailed, and any major feeling of the effect being dated when watching the movie 30+ years later is obscured in part by the black-and-white film. But it’s hard to me to completely dismiss a couple of issues. One of them is the final scene, where two good things are combined and somehow don’t work. Without spoiling (although I could probably get away with it here), the sequence uses Samuel Barber’s Adagio for Strings to great effect, and fades into a signature Lynchian surrealist clip with a voice-over narrating an Alfred, Lord Tennyson poem over shots of the stars before the film fades to black. Having these elements occur, one right after the other, feels like the end of the 124 minute movie is pushing it a bit in terms of oversentamentality, leaving a bit of an off-putting aftertaste to a film that otherwise had a good grip on how to handle its subject matter for a measured enough reaction. A smaller thing I noticed early on is, in a possible attempt to replicate the editing of older films, there are a few brief scenes that fade in, and fade to black – actual fade-outs, that made the pacing feel a bit choppy, at a vital early part of the movie where it’s still finding its footing with the audience (although it smoothens out quickly). These things possibly foolishly kept the picture from having the impact on me that it was clearly aiming for. 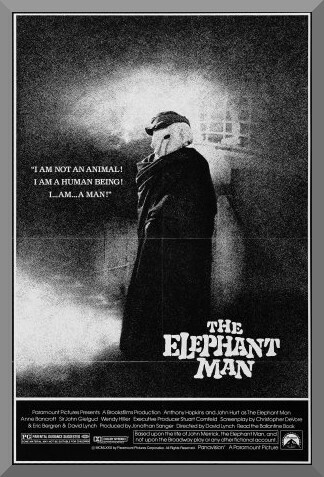 My largely nit-picking complaints, however, do not even begin to derail everything that The Elephant Man does indeed accomplish, which is craft an interesting biography, and simultaneously provide an important commentary, a reminder for us to look beyond a person’s outward appearance and see them for who they are within. Assisted with outstanding performances and equally credible talent behind the camera, it is clear that this is not only a notable entry on the filmography of its already legendary actors, but proof that when it comes to the legacy of David Lynch, he doesn’t need the Log Lady or a crazy-haired Jack Nance to make a mark on a viewer.